G&A is offering unpaid internship opportunities for qualified students interested in learning more about corporate sustainability and corporate ESG performance (“Environmental, Social, Governance”) issues. G&A Institute interns learn important elements about the Global Reporting Initiative (GRI) Standards for sustainability reporting as well as other common frameworks such as CDP, RobecoSAM CSA (DJSI), SASB, IIRC, SDGs, and concepts in sustainability such as materiality, stakeholder engagement, assurance, balance, comparability, and many others that can be used in their future work situations. The work will support G&A’s pro-bono unpaid relationship as the Global Reporting Initiative (GRI) data partner for the US, UK, and Ireland, along with contributing to associated research on sustainability reporting trends. This is a very fast growing area of interest to corporations and Wall Street. The GRI’s reporting framework and standards are the most widely used in the world for these types of reports. Location: Virtual — Work is done remotely – at your own location with a flexible work schedule. Initial training via virtual meeting tools. There will be opportunities to attend industry networking and training events with G&A’s network of event and training partners. Time Requirements: Position requires approximately 10 hours per week and begins ASAP. The timing of the work is flexible for a majority of the time required and can be done remotely. The internship will take place starting in September 2018 and ending May 2019. Compensation: This is an unpaid experience only internship position. In this role, you will work as part of a team to analyze sustainability reports for inclusion in the largest global database of sustainability reports, the GRI’s Sustainability Disclosure Database (database.globalreporting.org). Learning to read, analyze, use and structure data from reports using the GRI Standards, GRI G4, GRI-Reference, as well as NON-GRI corporate and institutional reports, will comprise the majority of this assignment. The research will also contribute to several published research reports on various trends in sustainability reporting which are widely referenced by media, academics, business, capital markets players and other important sustainability stakeholders. 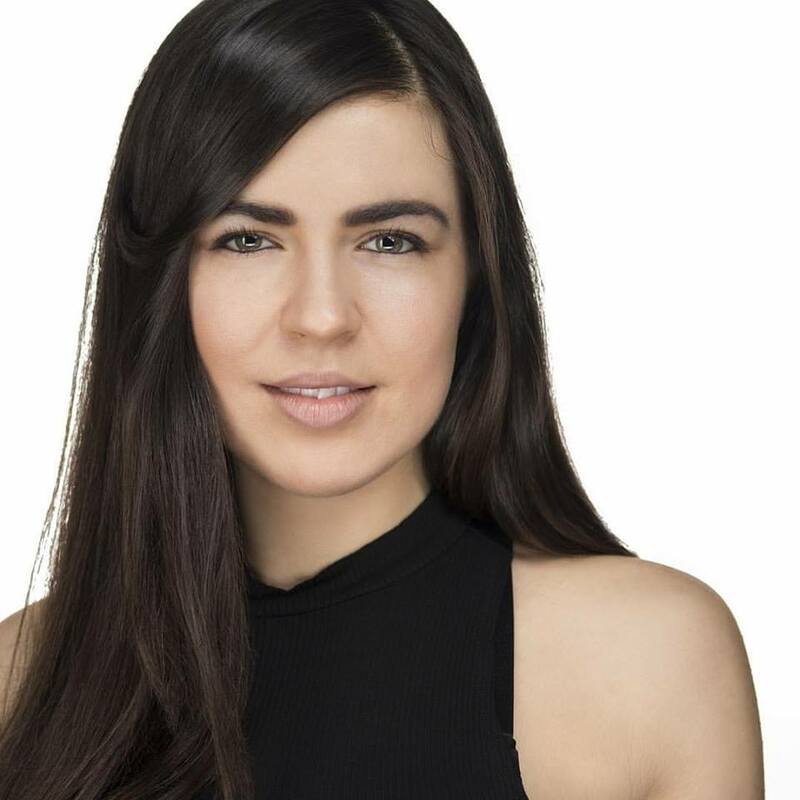 The student(s) selected will have the opportunity to experience a fast-paced, highly-adaptive (and nurturing) culture in a small but growing company with a unique niche. This is a hands-on position with a considerable learning opportunity for those headed for a career in corporate responsibility, sustainability, citizenship or impact investment. G&A interns get public recognition for their work in our published reports, on our web platform, and in other ways. Must be in senior year of Bachelors program or in a Masters program with major/studies focused on business, capital markets, ESG, environmental and/or sustainability issues and topics. Demonstrate strong background / keen interest or past work experience in ESG and sustainability-related issues / topics. Having a basic understanding of business and the capital markets is mandatory. Must have strong skillsets and experience in independent online research and analysis. Must be excellent at using Excel / Google Sheets and researching on Google. Have strong technical, communication and organizational skills. Must be self-driven and able to work independently to meet expectations and deadlines. Must be fluent in English, additional languages are a plus. Applicants with good writing and editing abilities will have a preference. A cover letter outlining why you would be a good fit for this role. Resume including your education, skill sets, and work experience. A one-to-two page introduction essay on what you would like to learn more about (in terms of your career goals), what your interests are, and anything else you feel may be relevant to the job/our organization. Samples of writing or research on sustainability or other topics are also a plus. Founded in 2006, Governance & Accountability Institute is a New York City-based company that specializes in research, communications, strategies and other services focused on corporate sustainability and corporate ESG performance (“Environmental, Social, Governance”) issues. G&A is the data partner for the United States, United Kingdom and the Republic of Ireland for the Global Reporting Initiative (GRI). The Global Reporting Initiative is a non-profit organization that promotes the use of sustainability reporting as a way for organizations to become more sustainable and contribute to sustainable development. GRI provides all companies and organizations with a comprehensive set of sustainability reporting standards that are the most widely used and respected around the world. Currently, thousands of global organizations use the GRI to report on their Environmental, Social, and Corporate Governance (ESG) strategies, impacts, opportunities and engagements (www.globalreporting.org). As the US, UK and Ireland data partner of the GRI, G&A’s role is to collect, organize, and analyze sustainability reports that are issued by corporations, public entities, not-for-profits and other entities in the United States, United Kingdom and the Republic of Ireland for the benefit of all stakeholders. Highlights from the strategic “21st Century Company” conference presented annually by Skytop Strategies in November 2017 at the Time Warner Center in New York City. In November, executives in governance, risk, innovation, corporate responsibility, and information technology, and representatives of other functions & disciplines gathered to discuss future trends and share thoughts on the theme of “how to prepare for the risks and opportunities that companies will face in the 21st Century”. Two prevalent topics of discussion among the executives present were (1) data security and (2) approaching CSR as an opportunity for ROI rather than as an expense. 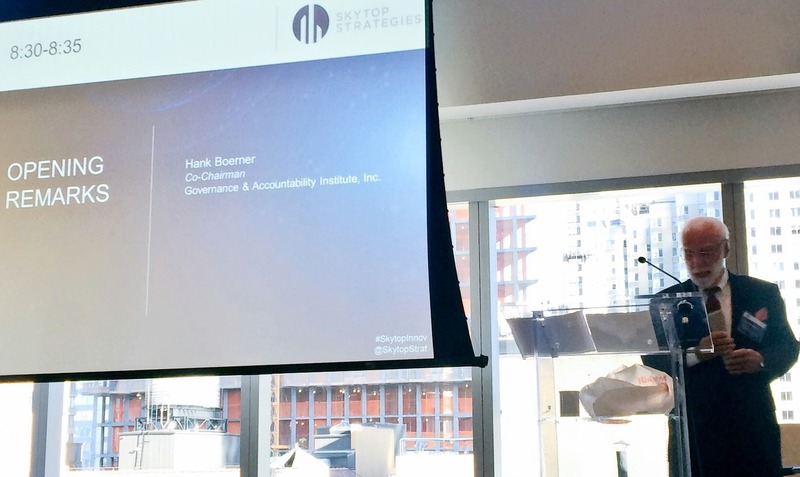 Hank Boerner, Chairman & CEO at G&A, started the morning off with opening remarks to set the stage for the day’s discussion. He suggested that regardless of the top-notch strategic planning, the 21st Century Company is likely to put forward, “disruptions” will always arise. Using retro props and the evolution of the cell-phone from the early “brick” phone and the revolutionary concept of making a call from anywhere to today’s smartphone (now holding a great deal of our personal information), Hank reminded the audience of the disruptions from the past few decades. 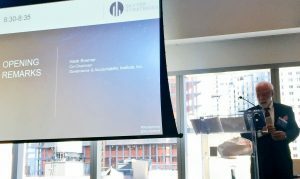 The event was held during the first anniversary of the 2016 U.S. Presidential election, which sparked rigorous conversations about what sustainability will look like for the United States over the next three years. The past year has involved the start of dismantling of some of the country’s most monumental environmental plans and agreements. While this has led to a dim outlook for sustainable’s future for some, others noted that the corporate world is remaining firm in their sustainability strategic plans and targets, due to stakeholders and investors’ increasingly persistent calls for climate change disclosures, even for the non-renewables industry. This reassurance has allowed many corporate sustainability advocates “to rest easy”. However, as Bennett Freeman, Senior Advisor, Business for Social Responsibility (BSR), mentioned during his panel, governance without government doesn’t work. Corporate social responsibility without government responsibility is insufficient — and sustainable development should not be left to solely corporations. Another trend creeping into CSR/ESG performance indicators is data security, presenting both opportunities and risks for companies. 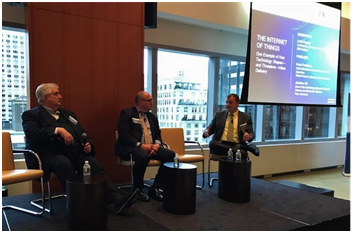 Louis Coppola, Co-Founder and Executive VP at G&A, moderated the panel “The Internet of Things: One Example of How Technology Shapes—and Threatens—Value Delivery” with panelists Gene Fredriksen, Chief Information Security Officer, PSCU & Appointee, Global Forum to Advance Cyber Resilience and Jonathan Hill, Dean of the Seidenberg School of Computer Science and Information Systems at Pace University. Key takeaway: Data is being hailed as the “oil of the 21st century”. The amount of data being collected during your day-to-day activities can be a little unsettling for some. The information obtained by third parties can support significant business decisions and product/service development. Data can hold unmeasurable value for a company’s future to make informed decisions. However, the question for debate is how responsible do we expect companies to be with our data? A spike in recent data breaches has left consumers feeling a little less secure, but it’s also left corporations feelingn uneasy about their brand reputation and the future of their data security plans. In 2017 alone, we have learned of significant data breaches at Yahoo, Equifax, Uber, Gmail, and many more companies. Currently, the Global Reporting Initiative (GRI) provides a voluntary reporting indicator (G4-PR8) asking companies to disclose the number of breaches of customer privacy had occurred during that reporting year. However, with the risk of significant cybersecurity breaches increasing, it’ll become more prevalent for the 21st Century Company to become much more proactive in protecting customer privacy; and, simultaneously, provide more detailed disclosure on a company’s data security efforts – this will be expected by shareholders. For more information on whether you’ve been affected by the recent Equifax breach, click here. Before surfing the Internet, secure your personal computers by updating your security software. Everyone’s computer should have anti-virus, anti-spyware and anti-spam software, as well as a good firewall installed. Choose a password by combining different numbers, letters, and symbols. The longer the password, the better. Beware of “bargains” from companies with whom you are unfamiliar — if it sounds too good to be true, it probably is! Act immediately if you suspect identity theft. Contact your credit card company, your bank, all three credit reporting agencies. 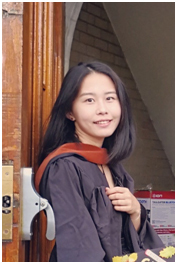 Cher Xue, GRI Reports Analyst at G&A Institute, Master in Environmental Management from Duke University, Nicholas School of the Environment. One very interesting presentation was entitled: The Arrow Electronics Story: How Innovation Can Drive Profits While Addressing Social Challenges. The presenter was Joe Verrengia, Global Director of Corporate Social Responsibility at Arrow Electronics, Inc.
Arrow Electronics is a global provider of products, services, and solutions to industrial and commercial users of electronic components and enterprise computing solutions. And humanitarian technology projects serve as a metaphor for what Arrow does every day in business. The presentation addressed some bias that has been expressed — such as there is no real ROI on CSR. As examples, some critics have said these things: Personal values don’t always translate to work values. People within the organization have no idea what it is and where to start to work. The CSR budget is the first one to cut because, for some business, CSR is not an investment, but an expense. Joe Verrengia addressed these negative projections and explained how Arrow Electronics sees ROI on CSR – starting with the Company’s brand itself — and to think about who we are as a foundation. Besides have ROI clearly demonstrated by direct numbers of additional revenue, for Arrow, ROI is generated through employee recruitment and retention, in that CSR can lead to greater employee pride. Today, for example, 80% of millennial choose work for a purpose-driven company. And 99% of Arrow’s interns decide to come back to work. ROI also comes from customers’ loyalty — 223 of Arrow’s customers now expect Arrow to be a good corporate citizen and demand annual proof of CSR through questionnaires. Because of Arrow’s work on humanitarian technology solutions, the firm also has attracted new customers who have seen the Company’s work on these projects and recognized that Arrow not only has the solutions expertise they need, but also shares the same values as well. Then there is ROI from “Brand”, which is reputational ROI. Arrow’s CSR technology projects have generated nearly two billion media impressions and more than 600 news stories in just a few years. The earned media value and the calculated brand value of these projects far exceeded what they cost. Arrow’s CSR program has a focus on guiding innovation that improves lives and provides opportunity. The CSR program is demonstrated through humanitarian projects, community investment, employee engagement and corporate reporting. For the purpose of measuring CSR program and score progress, Arrow has developed an engagement rating system by which the Company evaluates CSR partners and projects. The 10 categories of engagement include Innovation; CSR category alignment; Brand elevation; Social impact; Business development potential; Executive support; Arrow locations; Stature; Arrow V alignment; and, Employee Engagement. Arrow believes “Five Years Out” is the tangible future, and the Company’s innovations can make the world a better place for us all – now and five years out, which is exactly a 21st Century Corporation approach. Are you like many of us having sleepless nights and anxiety spells as you watch the antics of the Trump White House and the creeping (and similarly moving-backwards) effects into the offices of important Federal agencies that the Administration is taking over? Consider then “other news” — and not fake news, mind you, or alt-news — but encouraging real news that is coming from OTHER THAN the Federal government. We are on track to continue to move ahead in building a more sustainable nation and world — despite the roadblocks being discussed or erected that are designed to slow the corporate sustainability movement or the steady uptake of sustainable investing in the capital markets. 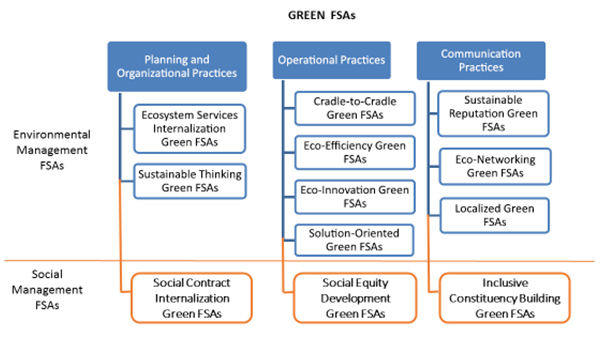 (1) sustainability of the business model and its operations; (2) attention to external and environmental factors that could impact the company; (3) recognition of the company’s role as a member of the communities in which it operates. A global company, CEO Fink wrote to the CEOs, needs to be “local” in every single one of its markets. And as BlackRock constructively engages with the S&P 500 corporate CEOs, it will be looking to see how the company’s strategic framework reflects the impact of last year’s changes in the global environment…in the ‘new world’ in which the company is operating. BlackRock manages US$5.1 trillion in Assets Under Management. The S&P 500 companies represent about 85% of the total market cap of corporate equities. Heavyweights, we would say, in shaping U.S. sustainability. As S&R investment pioneer Steve Viederman often wisely notes, “where you sit determines where you stand…” (on the issues of the day). More and more commercial space users (tenants and owners) want to “sit” in green spaces — which demonstrates where they “stand” on sustainability issues. Consider: In the corporate sector, Retail and other tenants are demanding that landlords provide “green buildings,” according to Chris Noon (Builtech Services LLC CEO). The majority of his company’s construction projects today can easily achieve LEED status, he says (depending on whether the tenant wanted to pursue the certification, which has some cost involved). The company is Chicago-based. This is thanks to advances in materials, local building codes, a range of technology, and rising customer-demand. End users want to “sit” in “green buildings” — more than 40% of American tenants recently surveyed across property types expect now to have a “sustainable home.” The most common approaches include energy-saving HVAC systems, windows and plumbing. More stringent (local and state) building codes are also an important factor. Municipalities — not the Federal government — are re-writing building codes, to reflect environmental and safety advances and concerns. Next week (Feb 28) real estatyer industry reps will gather in Chicago for the Bisnow’s 7th Annual Retail Event at the University Club of Chicago to learn more about these trends. Institutional investors managing US$17 trillion in assets have created a new Corporate Governance framework — this is the Investor Stewardship Group. The organizers include such investment powerhouses as BlackRock, Fidelity and RBC Global Asset Management (a dozen in all are involved at the start). There are six (6) Principles advanced to companies by the group that including addressing (1) investment stewardship for institutional investors and (2) for public corporation C-suite and board room. These Principles would be effective on January 1 (2018), giving companies and investors time to adjust. One of the Principles is for majority voting for director elections (no majority, the candidate does not go on board). Another is the right for investors to nominate directors with information posted on the candidate in the proxy materials. Both of these moves when adopted by public companies would greatly enhance the activism of sustainable & responsible investors, such as those in key coalitions active in the proxy season, and year-round in engagements with companies (such as ICCR, INCR). No waiting for SEC action here, if the Commission moves away from investor-friendly policies and practices as signaled so far. And perhaps – this activism will send strong messages to the SEC Commissioners on both sides of the aisle. Remember: $17 trillion in AUM at the start of the initiative — stay tuned to the new Investor Stewardship Group. These are more “Universal Owners” with clout. Not really unexpected but disappointing nevertheless: The Trump Administration made its moves on the Dakota Access Pipeline (DAPL), part of the Bakken Field project work, carrying out a campaign promise that caters to the project’s primary owners (Energy Transfer Partners**) and other industry interests, S&R investors are acting rapidly in response. and ignore alleged shortcomings in the required environmental review (under the National Environmental Policy Act – NEPA). These are “abuses”, and banks and financial services firms involved may be complicit in these violations by the nature of their financing, S&R investors note. Their involvement in the project financing could impact their brands and reputations and relationships with society. And so S&R shareholders are taking action. Boston Common Asset Management, Storebrand Asset Management (in Norway) and First Peoples Worldwide developed an Investor Statement to Banks Financing the DAPL. The statement — being signed on to by other investors — is intended to encourage banks and lenders to support the Rock Sioux Tribe’s request for re-routing the pipeline to not violate — “invade” — their treaty-protected territory. The violations pose a clear risk, SRI shareholders are saying. The banks involved include American, Dutch, German, Chinese, Japanese, and Canadian institutions. They in turn are owned by shareholders, public sector agencies, and various fiduciaries — “Universal Owners,” we would say. The banks include: Bayerische Landesbank (Germany); BBVA (Argentina); Credit Agricole (France); TD Securities (Canada); Wells Fargo; ABN AMRO (The Netherlands); Bank of Tokyo-Mitsubishi UFJ; and Industrial and Commercial Bank of China, and others. The shareholders utilizing the Investor Statement say they recognize that banks have a contractual obligation with the respect to their transactions — but — they could use their influence to support the Tribe’s request for a re-route…and reach a “peaceful solution” acceptable to all parties. As The Washington Post reported on January 24th, soon after the Trump Administration settled in, President Trump signed Executive Orders to revive the DAPL and the Keystone XL pipelines. “Another step in his effort to dismantle former President Barack Obama’s environmental legacy,” as the Post put it. One Executive Order directed the U.S. Army Corps of Engineers to “review and approve in an expedited manner” the DAPL. Days later the Corps made their controversial decision, on February 7th reversing course granting Energy Transfer Partners their easement. This week the remaining protestors were removed from the site (some being arrested). The sustainable & responsible & impact investment community is not sitting by to watch these egregious events, as we see in the Investor Statements to the banks involved. The banks are on notice — there are risks here for you. Energy Transfer Partners, L.P: (NYSE:ETP) This is a Master Limited Partnership based in Texas. Founded in 1995, the company has 71,000 miles of pipelines carrying various products. The company plans to build other major pipelines — the Rover Project — to carry product from the shale regions (Marcellus and Utica) across the Northern U.S. state east of the Mississippi. ETP LP acquired Sunoco (remember them?). Mutual Funds – Bond Holders – other key fiduciaries with brands of their own to protect — are funding the operations of ETP LP. We are seeing in developments every day (like these above with non-governmental strategies and actions) that hold out promise for corporate and societal sustainability advocates and sustainable investment professionals that with — or without — public sector support, the Forward Momentum continue to build. We’ll share news and opinion with you — let us know your thoughts, and the actions that you / your organization is taking, to continue the momentum toward building a better future…a more sustainable nation and world. Out the Seventh Generation, as the Native American tribes are doing out in the American West in protecting their Treaty lands. In that regard we could say, a promise is a promise — the Federal and state governments should uphold promises made in treaties. Which are covered as a “guarantee” by the U.S. Constitution that some folk in politics like to wave around for effect. Quo Vadis, The Peoples’ U.S. EPA — Where Now in the Trumpian Era? Quo Vadis (where are we going) with our Environmental Protection Agency? The leader’s baton is passed and the U.S. EPA has a new head of agency. E. Scott Pruitt got passed the opposition mounted to his nomination by President Trump and is now the 14th Administrator of the Agency. He was the Attorney General of the State of Oklahoma. Where he mounted more than a dozen attacks in the courts against the Federal protector of land, air, water and more. The cases are still pending; Administrator Pruitt has not yet said he would recuse himself from the proceedings. The lawsuits challenged EPA on various rules dealing with mercury pollution, carbon emissions, smog, protecting of waters and wetlands, and more. And — “…as Administrator, Mr. Pruitt will lead EPA in a way that our future generations inherit a better and healthier environment while advancing America’s economic interests…” We are on notice, I would say. Meanwhile, hundreds of current and former EPA employees had urged the U.S. Senate NOT to ratify the nomination (450-plus signed on). In Chicago, at lunch time, possibly imperiling their careers at the Agency, EPA Region 5 employees poured out of the office and into the streets at lunch time in protest. More than two dozen environmental groups also challenged his qualifications. Oh yes, Administrator Pruitt was speaking in the Rachel Carson Green Room at EPA (named for the author of Silent Spring, which helped to launch the modern environmental movement). Perhaps someone passed along her book to the new leader. The Administrator did say, according to the Post, that the EPA and the nation could do a better job of being both pro-energy and pro-environment. Time will tell, we could say, as the actions and proclamations and loud and whispered orders come down from on high at EPA in the days ahead. for clues as to what may be ahead with Scott Pruitt at the helm, we could look to a commentary that the new EPA Administrator published on Public Utilities Fortnightly — ” The Methane Myth” Incompetence and overreach at the EPA… (July 2012). And…”…The agency’s actions are at best incompetent, and at worst reprehensible. They have a very real effect on families, businesses, communities, and state economies. Without justification, they erode the states’ ability to self-regulate, and they stifle exploration of domestic energy sources, putting our national energy security at risk..”. NRDC and other of its peer NGOs and SRI investors and state officials will be watching the EPA actions VERY CLOSELY in the days ahead, we can say with some assurance. In response to a legal action by the Center for Media and Democracy, thousands of the AG’s emails were released. The communications highlight, the Post report says, close relationships between AG Pruitt and fossil fuel interests. Top of the news: a plant in Arizona that is the largest coal-fired facility in the western part of the United States (the 2,250-MW Navajo Generation Station outside Page, AZ) will be de-commissioned by the owners/operators at the end of 2019 — decades before expected, said the Post. In the era of low natural gas prices, the use of coal would cost more to produce electric power, which would be passed on to the rate base. The US EPA had listed the plant as the #3 of the major carbon-emitting facilities. The facility is operated by the Salt River Project, utility companies and the U.S. Bureau of Reclamation*. The facility serves the Phoenix area. The downside: members of the Navajo and Hopi tribes would (1) lose their jobs in the Kayenta Mine that provides that provides the coal, and (2) the tribes will lose certain royalty payments. Cautionary note: The tribes of other operators could step up to continue operations. And less than a month earlier, in the State of Ohio the Dayton Power & Light Company and the Sierra Club reached agr3eement to close two plants (Killen and Stuart) which are coal-fired facilities. These will close in mid-2018. Stuart is a 2,440-MW plant; Killen is 666-MW. Dayton Power & Light will develop solar power facilities to generate about half of the 555-MW by 2022. The state’s Public Utilities Commission has the plan for its approval from DP&L. This is good news for environmental NGOs and Ohio consumers; rate payers would be paying more for their electric power with coal — and be breathing in the results of coal-burning. All of this, of course, comes as President Trump continues to promise to bring back coal mining, and signed an Executive Order to remove the obstacle for mining companies to dump wastes into surface waters (something that President Obama moved to prevent). The shift from coal to natural gas: Forward Momentum in 2017 for sustainability! Footnote: About the Bureau of Land Reclamation*, from its web site: Established in 1902, the Bureau of Reclamation is best known for the dams, powerplants, and canals it constructed in the 17 western states. These water projects led to homesteading and promoted the economic development of the West. Reclamation has constructed more than 600 dams and reservoirs including Hoover Dam on the Colorado River and Grand Coulee on the Columbia River. The Bureau is the largest wholesaler of water in the country, bringing water to more than 31 million people, and provided one-out-of-five Western farmers (140,000) with irrigation water for 10 million acres of farmland that produce 60% of the nation’s vegetables and 25% of its fruits and nuts. Here we are in the year 2017 — and I see momentum coming into this new calendar year for continuing many of the positive trends for corporate sustainability / citizenship / responsibility managers, and sustainable investment professionals that I explored and commented on in 2016. In my first post of 2017 I explained some of these trends and provided background on the many experts and thought leaders that shared their perspectives with us on key topics and issues. Going forward, I am going to update the trends material with current news and developments and shared perspectives from third parties. I see this as continuing momentum for the positive trends — even in the face of hostile action that is anticipated in our nation’s capital. So I am positioning my comments as “Momentum 2017 – Sustainability Forward!” for corporate sustainability and sustainable investing professionals. And for NGOs and other stakeholders. The 2016 trends are available for you in total on our G&A Institute web site (under Research menu). The updates going forward will include the original materials that I saw as being forward-moving and in many instances helping to make “the business case,” “the investing case,” and so on. Here’s the first update for 2017 and the original perspectives shared in 2016. January 2017 – Momentum – Forward! Thousands of American Roman Catholics have petitioned President-elect Donald Trump to urge him to “take swift and meaningful action on climate change,” including honoring commitments and pledges made by President Barack Obama. Keep the U.S. commitment to the Paris Agreement and go forward on the U.S. pledge to cut GhG emissions to 26% / 28% of the 2005 levels by year 2025. Keep the U.S. pledge of $3 billion to the Green Climate Fund to help developing countries address climate change (mitigation, adjustments), including the development of sustainable energy resources. The Catholic coalition cited Pope Francis’s Laudato Si (encyclical) — On Care for Our Common Home – to remind the President-elect and his minions of the importance to the Roman Catholic Church worldwide of climate change and environmental and social issues to be addressed. The U.S. Conference of Catholic Bishops (USCCB) strongly supports a national carbon pollution standard — as one way to move forward to implement the Paris (COP 21) Agreement of 2016. The Catholic Climate Covenant is gathering signatures for its appeal to the new President and communicating its appeal on [his] favorite channels – social media! The petition notes that before Pope Francis came to the USA in September 2015, a Public Religion Research Institute poll found three-out-of-four Catholics believed that the U.S. government should be more to address climate change. When white-only respondents were tallied, the percentage rose to 86%. More recently (May 2016) a Center for Applied Research in the Apostolate at Georgetown University showed the amount held steady, with 73% of American Catholics in favor of society taking steps to combat climate change. The Covenant petition has been endorsed by the Global Catholic Climate Movement; the Leadership Conference of Women Religious; the Conference of Major Superiors of Men; the Sisters of Mercy; and the Franciscan Action Network. And in January, the President-elect can expect to see more than 100 prayer vigils stages across the country and during his first 100 days in office. That way, there will be clear demonstration against his climate-skeptic appointments and for an environmentally-sustainable future. There are an estimated 1 billion Catholics worldwide, and a huge infrastructure of the RC Church that can implement policies and practices. Worldwide, the Bishops of the Church among other things are traditional heads of local dioceses — there are 177 in the U.S.A. alone. There are “ecclesiastical provinces” organized in metropolitan area; these are usually headed by an archbishop (New York, Washington DC, Baltimore, etc.). The Roman Catholic Church as a collective institution is one of the largest owners and holders of assets in the world, including properties, solid gold, bonds, cash, and equity investments, pension systems of various orders, Catholic charities, and healthcare systems. The Bishop of Rome, Pope Francis, in May 2015, issued “Laudato Si,” the Encyclical Letter of the Holy Father, “On Care of Our Common Home.” Among other things to explain his position, he addressed a joint session of the U.S. Congress in September 2015. (Note that in the audience, 31% of Members are Catholic, as well as six of the nine Supreme Court Justices.) The speech received 37 standing ovations. “We should have a culture of care,'” Pope Francis said, and “now is the time for action” to protect our planet. • Pollution and climate change are a threat to the world. • Part of the cause is the residue of industrialization. • Part of the cause is our throwaway society. • The climate is a common good, belonging to all. • Warming has effects on the carbon cycle. This affects drinking water, agriculture, energy and other activities. • Climate change is a global problem, affecting environmental, social, economic, political, and distribution of goods. • There are critical issues in water, biodiversity, global inequality. Pope Francis called for a vision of “integral ecology,” one that seriously considers environmental, social and economic factors. The Holy Father set out suggestions for “approach and action,” with dozens of specific steps that could be taken to address challenges and bring about integral ecology. It is in these specificities that action will come through the organs of the worldwide RC Church, and its billion adherents to the faith. We should not underestimate the enormous power that will be applied in many direct, indirect and subtle ways to implement “Laudato Si,” the Holy Father’s vision of how his church can help to bring about significant changes in the global society. Consider the work of the Interfaith Center on Corporate Responsibility (ICCR), the 35-year old faith-based investment coalition, whose 300 institutional members manage up to $100 billion in assets. ICCR is a value-driven organization “who view the management of their investments as a powerful catalyst for social change.” ICCR’s membership includes many RC Church institutional investors. We can expect to see the Pope’s vision applied by ICCR institutional members in the areas of concern — corporate governance, domestic health, the environment (including global warming), fair lending, food access and safety, human rights, and water (including corporate water impacts). This was Pope Leo XIII and his 1891 letter, “Rerum Novarum” — on “the Rights and Duties of Capital and Labor.” This addressed the conditions of the working classes as industrialization and the emergence of the modern capital markets gained momentum. What resonates from that work for some today: “Remedy must be found quickly for the misery of wretchedness pressing so unjustly on the majority of the working class…” Through the decades since the start of the 20th Century, RC Church interests have been guided by Rerum Novarum’s dictates to the faithful. Expect the vision of the present pope to serve RC Church interests in similar ways — with impacts being felt in discussion of climate change, global warming, the plight of the worker, income & wealth inequality, financial & economic fairness, and many more issues that are in the realms of the capital markets and the global corporate community. What needs more understanding, says MSCI in its report, is how corporations feed into inequality (through job cuts, pushing down of wages, maximizing shareholder return) which over time could impact economic growth and stability. So – in the year 2016 we’ll be monitoring the growing intensity of the public debate about wealth and income inequality, in the presidential race for sure (thanks to U.S. Senator Bernie Sanders and his positions on the subject), in the fiduciary concerns raised (especially by activist investors), and in the restlessness of the population if the anger rises and targets are selected (that is, those perceived to be responsible for growing inequality in developed and developing countries). The actions of the worldwide Roman Catholic Church, following the Pope’s positions on inequality, will be important to watch in the months ahead. What are your thoughts? Let us know! Send me an email at: hboerner@ga-institute.com.